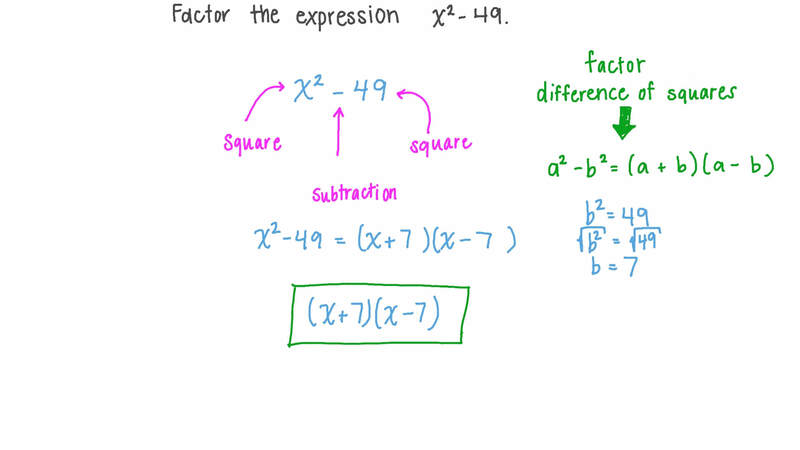 In this lesson, we will learn how to rewrite expressions by expanding, factoring, and simplifying and become familiar with some useful identities. Factorise fully 6 4 𝑥 − 8 1 2 . Factor the expression 𝑥 − 4 9 2 . Factor 𝑎 − 6 𝑎 𝑏 + 9 𝑏   . Factor 𝑥 + 6 𝑥 + 9 2 . 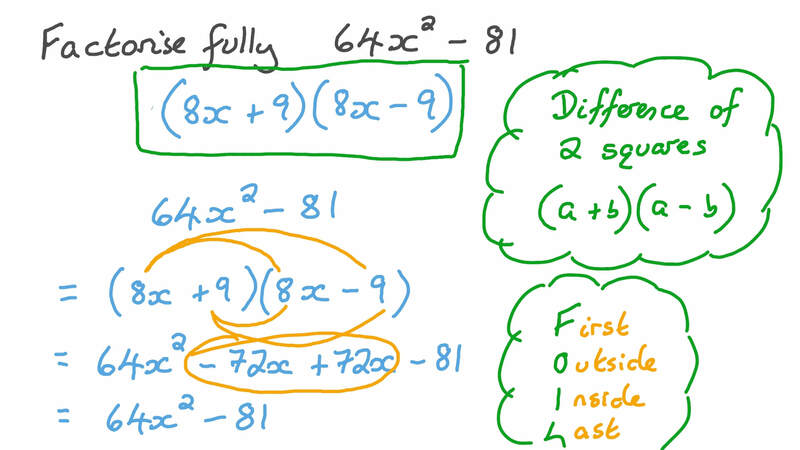 Determine which of the following expressions is equivalent to 𝑝 − 𝑞 𝑝 + 𝑞 2 2 . An identity is an equation that is true for all values of its variables. For example, 2 ( 𝑎 + 𝑏 ) = 2 𝑎 + 2 𝑏 is an identity because it will be true for all values of 𝑎 and 𝑏 . Expand and simplify  𝑥 − 𝑦  + ( 2 𝑥 𝑦 ) 2 2 2 2 . Factor 𝑥 + 2 𝑥 𝑦 + 𝑦 4 2 2 4 . Is the equation  𝑥 + 𝑦  =  𝑥 − 𝑦  + ( 2 𝑥 𝑦 ) 2 2 2 2 2 2 2 an identity? Substitute 𝑥 = 3 and 𝑦 = 2 into the identity ( 𝑥 + 𝑦 ) = ( 𝑥 − 𝑦 ) + ( 2 𝑥 𝑦 ) 2 2 2 2 2 2 2 to generate a Pythagorean triple. Answer the following questions for the brackets ( 𝑥 − 𝑦 ) ( 𝑥 + 𝑦 ) . Expand the brackets ( 𝑥 − 𝑦 ) ( 𝑥 + 𝑦 ) . Is the identity ( 𝑥 − 𝑦 ) ( 𝑥 + 𝑦 ) = 𝑥 − 𝑦 2 2 true? Is the equation 𝑥 + 𝑦 𝑥 + 𝑦 = 𝑥 + 𝑦 2 2 an identity? Is the equation 𝑥 + 𝑦 𝑥 + 𝑦 = 𝑥 + 𝑦     an identity? Is the equation 𝑥 + 8 𝑥 + 1 3 = ( 𝑥 + 8 ) − 8 𝑥 − 5 1 2 2 an identity? Factor the expression 4 𝑎 − 9 𝑏 2 2 . Factorise fully 𝑎 𝑏 − ( 𝑎 𝑏 − 5 ) 2 2 2 . Factorise fully 𝑏 ( 𝑎 + 8 𝑏 ) − 𝑏 ( 𝑎 + 8 𝑏 ) 3 3 . Factorise fully ( 5 𝑎 − 3 ) − 3 6 2 . Expand and simplify ( 2 𝑥 − 3 𝑦 )  5 𝑥 − 5 𝑥 𝑦 − 𝑦  2 2 . 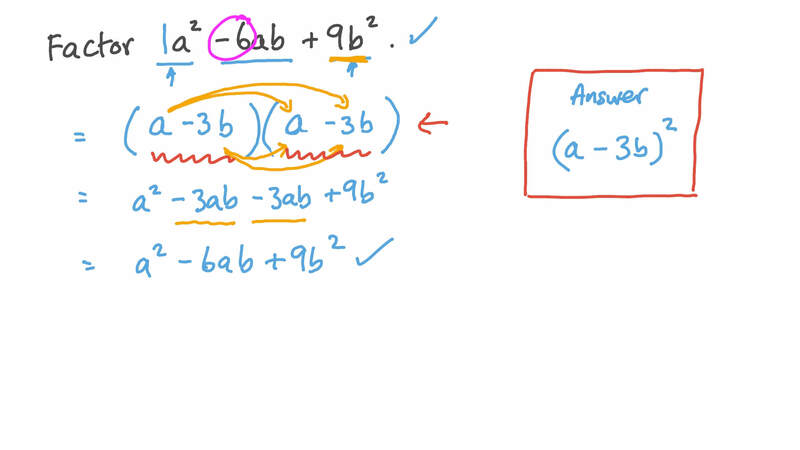 Write two equivalent expressions for the area of the following figure. Express the following using symbols: The product of 4 and 16 plus 11.